Sew ornaments, either for the holidays, or, using different colors and simple shapes, for other seasons (see p. 122 for ideas). This class is for beginning to intermediate sewists ages 6–10. It can either be taught just for children or as a coop class for a student and a chosen favorite adult (such as a parent or grandparent). No prior sewing experience is required. During the class, students will learn the running stitch and whip stitch, and they will make at least one ornament that they can use to decorate their home or give as a gift. 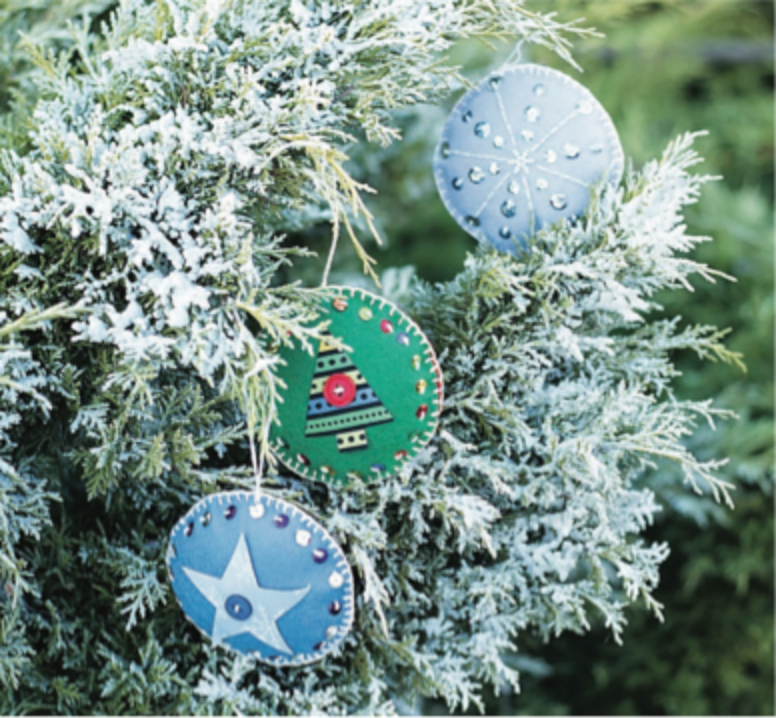 Children will enjoy learning hand-sewing skills while creating a keepsake ornament. Class can be 1–1.5 hours in length. TIP: Students may want to come ahead of class to shop for their felt and decorations. Seasonal fancy buttons may be helpful. Also, students may want to shop for a container to keep their supplies handy, creating a sewing basket or box with little bottles or bags to hold sequins and decorations. Teachers and helper adults should read Notes for Adults (pp. 130–131) for information about how to help children sew. Teachers should also read Tips and Tricks for sewing with groups of children (p. 131). The classroom should have markers and scissors (for tracing patterns and cutting felt), if possible. Scissors that are not too big for children are recommended. It will also be helpful to create template circles on cardstock (p. 136), one for each student, that students can trace onto felt. A few template shapes on cardstock for appliqué can be shared (tree and star, p. 140). Use directions to trace and cut pattern pieces (p. 19) to create two circles. Follow directions on page 123 to decorate one circle for the ornament. Use pages 13-14 to learn how to tie a knot and sew a running stitch (dolphin stitch). Page 20 shows how to sew decorations onto the felt. Optional: Cut a shape to stitch onto the front of the ornament. Use the pattern pieces on page 140 or make up your own shape. Decorate with buttons, sequins, and beads. When finished decorating the front of the ornament, tie a knot to secure the thread (p. 17). Optional: decorate the back circle as well. Sew the ornament together using directions on page 123. Stuff the ornament. Optional: add a scent with a tea bag or cinnamon sticks. Add a thread to hang. Admire your lovely ornament! Make another for a gift if you have time. Adult: If challenges come up, check page 23 for advice on helping with tangles or scrunching.